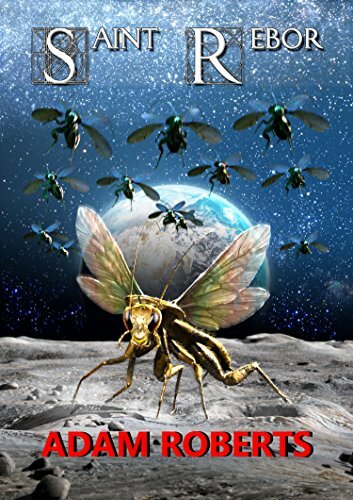 To read the science fiction of Adam Roberts—certainly to read the eleven stories collected in Saint Rebor—is to be confronted by a contradiction inherent in the very term "science fiction." As Roberts puts it in his introduction: "what is science but an attempt to determine the truth of things? And what is fiction if not a socially acceptable form of lying?” (p. 10) In other words, these are stories in which notions of truth are held in tension with the shaping, distorting forces of fiction—or perhaps it's the other way around. The opening story, "What Did Tessimond Tell You? ", illustrates the kind of territory explored in Saint Rebor. It is presented as a text written by Ana Radonjić, leader of a team of scientists preparing to announce the results of their work investigating the expansion of the universe, work certain to gain them the Nobel Prize—until, one by one, the members of the project team start to quit. It transpires that each has spoken to an individual named Tessimond, who told them something that changed their minds so drastically, it made them give up. Radonjić determines to find out what this was; she discovers that Tessimond is a former professor of theoretical physics—has he already traveled down the same road as Radonjić, and if so, what could he have seen? In many ways, "What Did Tessimond Tell You?" is a straightforward story of an individual learning the truth about the world, and its prose is largely measured and matter-of-fact to match. But a closer look starts to reveal a few oddities. During the story, Radonjić is pregnant, and refers to her developing foetus as "Phylogeny-Ontology-Recapitulator," an act of distancing through scientific terminology that comes to feel out of place because it's the only real example in the story. There's also the occasional instance of poetic imagery ("cars doing their crazy corpuscle impressions along the interchange," p. 11), which is at odds with the story's predominantly plain language. These features act as glitches in the system of Roberts's prose, reminders that we're not reading a transparent account of discovery. In terms of the larger story, Radonjić ultimately ends up as the opposite of the stereotypical scientist-hero: rather than working to uncover a truth about the universe that opens up new possibility, she is told a truth that closes down her horizons. She could also be seen as the inverse of the classic weird fiction protagonist: instead of frantically scribbling down her testimony before something eldritch her way comes, Radonjić has no such urgency, and her story is left to dissipate into mere (or utter) text. In "What Did Tessimond Tell You? ", the shape of the fiction is broken by the science. The story focuses on a group of humans on a Martian base, who try to find out from the Hitchers why the human capacity for pleasure has been taken away—until they get a very practical demonstration of why. Roberts’s prose moves between a giddy rush of wonder at the grand vistas of space, and a more dispassionate tone reflective of a world in which functionality means more than emotion. These competing tones could also be seen as embodying the contrast between sense-of-wonder SF and practical science fact; “Anhedonia" has the measure of the pros and cons of both. We can see from this quotation how Roberts twists his language to match the perspective of the story—not just in terms of viewing organic life as the Other, but also in the stiff formality of the prose, which reflects mechanical thought. As a piece of fiction, "Mocputer" derives its key effects from the gap between its human readers and machine protagonists: what the characters have to discover is what we already know, and vice versa. By the end, the story—what was fiction, and what science—has been turned inside out. "Trademark Bugs: a Legal History" takes the form of an academic paper from a future in which private corporations release their own genetically modified pathogens into the environment, and sell the cures to those unlucky enough to catch them. The "article" details the legal challenges against Trademark Bugs, and the knotty arguments used to defend them—they encourage good hygiene, and if you didn't take the sensible basic precautions, you've as good as consented to catching a disease—as well as the Bugs' subsequent effects on society and conflict. It’s the tone that works so well in this piece: academic prose, which purports to be transparent, but actually serves to distance its readers from the reality of the world created by these pathogens (even more so because it focuses on the legal aspects of events, rather than the events themselves). Furthermore, the fictional paper is presented as having been co-authored by parties who have rather different views on Trademark Bugs, so any façade of objectivity ultimately evaporates. The form of "Trademark Bugs" strips the flesh from the story’s bones, highlighting just how much has been lost in the process. As so often in Saint Rebor, the truth is a malleable, contested quantity. David Hebblethwaite was born in the north of England, went to university in the Midlands, and now lives in the south. He has reviewed for various venues, including Vector, The Zone, Fiction Uncovered, and We Love This Book. He blogs at Follow the Thread.